Now available for rent through MP&E. 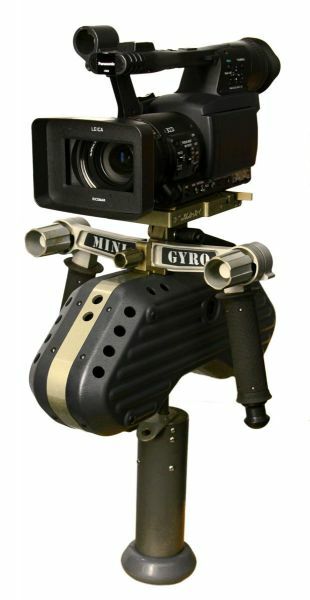 Tyler Minigyro Stabilizing Camera mount is one of the first stabilizing camera mounts to go from one shooting platform, i.e. helicopter to another such as, car, motorcycle, ATV, etc., in one easy set up format. The latest stabilizing camera mount with great versatility. It's compact size makes it the perfect choice for working in tight spaces. Some of the features of the Tyler Minigyro stabilizing mount are: variable position handles, camera quick release mounting plate, adjustable tilt head for shooting up or down and specially developed shock tube to eliminate vibration and support the Minigyro and camera package. There are 2-Kenyon K-8 gyros which provide opposing forces to enhance a smooth shot. The Minigyro runs on 24 volt battery. For easy of transport, the Minigyro comes in a shipping case with wheels, and total shipping weight without batteries is only 43 lbs. Batteries and accessories are extra.